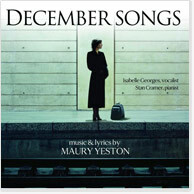 From PS Classics, the label that released the Grammy-nominated cast album of Maury Yeston's Nine: The Musical (not to mention the acclaimed Maury Yeston Songbook), comes this new recording of DECEMBER SONGS, Yeston's ravishing retelling of Schubert's Winterreise: part song-cycle, part cabaret piece, part music theatre showstopper. The singer: French-born Isabelle Georges, who performed the work to great acclaim during a three-month engagement at the Theatre du Renard in Paris during the winter of 2004–05. The album features a new orchestration by Larry Hochman (Spamalot, A Class Act, Jane Eyre) and includes the premiere recording of a new Yeston song, “Strange."